Some monsters are real. Miles away from the hectic city, Reed and Rebecca hike into the beautiful Northwestern woods. They are surrounded by gorgeous mountains, waterfalls, and hundreds of acres of unspoiled wilderness. During their first night of camping, an unearthly wail pierces the calm of the forest. Then something emerges from the dense woods. Everything that follows is a blur to Reed—except the unforgettable image of a huge creature carrying his wife into the darkness. Enter into deep wilderness where the rules of civilization no longer apply. A world where strange shadows lurk. Where creatures long attributed to overactive imaginations and nightmares are the hunters . . . and people are the hunted. 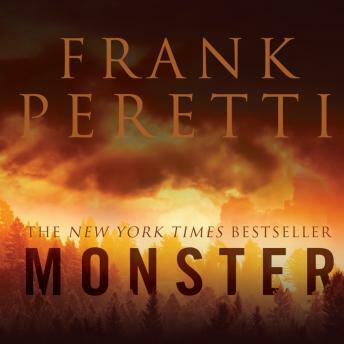 Frank Peretti delivers page-turning thrills and keeps listeners guessing in this New York Times best-selling novel where things that go bump the night are only a heartbeat away. Peretti is a master writer and articulate voice actor as well. I recommend this book to anybody interested in a serious dialog about Evolution. Peretti's book vividly illustrates what happens when a society is misled by a survival-of-the-fittest mentality. Interesting story. I was hoping for something a bit more spooky, but it kept me interested. I'm not really sure what happened there at the end of the book, as one major plot point was completely ignored. Aside from that, I was rather surprised how fast the book moved in the first two discs, before dropping off into the "Get On With It!" territory 11 discs tends demonstrate. The narration wasn't horrible, but I could really do without the sound effects, as they were inconsistent and jarring, distracting from what was being said as you wondered "What the hell was that?!" The "Christian theme" was surprising and mildly disappointing, as there was no backing of the dismissal of scientific claims, just flat statements. In fact, depth of detail was lacking in a few places and detail was lingered over in yet others, leading to an inconsistent interest level from the listener. Overall it wasn't a bad book, but it didn't leave me with a burning desire to read the rest of this author's repertoire. i have no idea if this was a good story because frank peretti should stick to writing books not reading them. i could not get in to the story because his voice for the characters was so bad i just could not get into it. i will have to read the book. mr peretti needs to let someone with better voice read his books. really bad. I’m usually sympathetic to books with a Christian theme as long as it doesn’t smack you over the head. That said this was maybe the worst audiobook I have ever listened to in ten plus years. I didn’t like the premise, (Big Foot goes wild) the female lead (I understand in these PC times it’s correct to have a character with a disability but stuttering?) It didn’t contribute to the story line and its just distraction in audio book it’s REALLY annoying, but what made me really strongly dislike the female lead she was a real wimp. I couldn’t finish it usually I can wade though the worst muck but not this time. Excellent story! This one will hold your attention! This book is not good for several reasons. The narration is just plain terrible. Mr. Peretti makes his characteres sound whiney and condescending. The women particularly. Any character who gets angry sounds like a two year old having a tantrum. To make it worse, one of the characters has a stutter. Listening to Mr. Peretti stuttering along is like torture. I almost didn't make it through the first disc. If you can make it through that first one, the story is just okay after that. It got a little slow in the middle and ended okay. Nothing to get too excited about. Storyline got pretty interesting, the further you got into the book, but somebody should tell the author to give up reading his own stuff. For the first couple of chapters, when he was reading the female voices, I had a hard time hearing him. He was doing this high-pitched, whispy thing that was most irritating. My advice to him, keeping writing and leave the narrations to the professionals. As for the story, if you can get past his voice, the story is okay. I have read a couple of Mr. Peretti's books and liked them very much. This is the first one I have listened to. Unfortunately, I could not get beyond the narration to pay attention to the story. I sent it back before finishing the first CD. He should stick to writing. Hire a narrator. Hard to focus on the story due to the author's narration style. Destroyed it for me - felt as though he was reading to a child a good portion of the story. I rarely lose focus on audio books but this was one where minutes would go by where I did not listen due to his style. Plot was standard for a thriller - keep in mind Peretti ties in Christian themes, so that may be a turn off for some. Much better thriller options out there.